The Gold Coast is perhaps the best-known tourist region in Queensland, and there is plenty of information available on coastal accommodation, principally in high-rise apartments, hotels and resorts. The Gold Coast is fun, flashy, exciting and busy. Superb beaches, fantastic shopping, bronzed beach goers and meter maids are all part of the Gold Coast experience. In the tradition of the Beautiful Accommodation series, we wanted to look behind the razzmatazz and find some truly special experiences that would allow readers to enjoy all the fun of the Gold Coast, yet have somewhere to retreat at the end of the day to relax and recharge or alternatively, offer a completely different experience. Try Avica and Ruffles Lodge – close to the coast action but a world away when you want to escape, while The Golden Door Health Retreat offers a very different health and lifestyle experience. The Gold Coast hinterland has three principal regions we want to share – Tamborine Mountain, Springbrook, and the Lamington National Park Each offers the promise of lovely cold winters (light up the fire and settle down for a cosy evening) and beautiful cool summers, providing the perfect climate to get out and enjoy all that his natural environment has to offer. Tamborine Mountain (Taking in the areas of Mount Tamborine, North Tamborine and Eagle Heights and surrounds) is just an hour south of Brisbane. Whichever way you approach, the drive is memorable, with winding roads affording lovely views along the way. 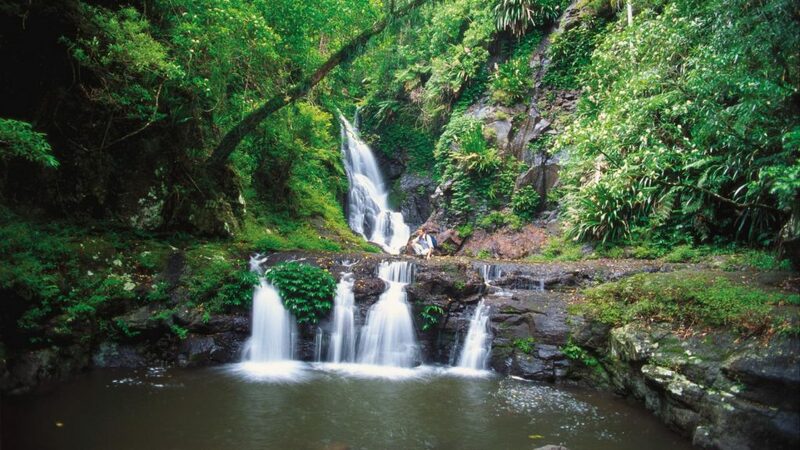 A stay at Tamborine Mountain offers a variety of experiences, including wilderness walks and some picturesque waterfalls. Curtis falls and Witches Falls (Queensland’s oldest national park) are two popular choices and the ancient cycads at lepidozamia Grove are not to be missed either. Another popular aspect to the area is the restaurants, cafés and galleries, particularly along Gallery Walk – a whole street devoted to arts, crafts and eating that will keep confirmed shop-a-holics occupied for hours, browsing from shop to shop. There are also some great cafés and restaurants at North Tamborine, which is a little quieter and well worth exploring. Springbrook Plateau is a true gem of an area, a place of natural beauty accessed by a magical drive up the mountains. This is an area of dramatic gorges, waterfalls and exceptional rainforests. A natural wonderland, thousands of years in the making. At 900 metres above sea level, it is much cooler on the plateau, offering the perfect respite from the warmer, humid weather down below. Undoubtedly Purlingbrook Falls is a must see for all visitors (and is only a short walk from the car park). It flows all year but in summer when rainfall is highest, the falls are spectacular. Springbrook has a delightful country feel, relaxed and quiet with some lovely little galleries and tea shops along the way. This is the perfect place to take time out and slow down, a delightful blend of the natural environment with the pampering and luxury offered by some truly superb accommodation options. The Lamington National Park is south-east Queensland’s largest undisturbed area of tropical rainforest, a stunning legacy of forebears who had the insight to lobby for the establishment of the park in the 1930s. This area is part of the Scenic Rim, created by volcanic activity, which explains both the dramatic physical environments and the diversity of plants and animal like it now supports. Expect to see red-legged pademelons, whiptail wallabies, king-parrots, crimson rosellas, Albert’s lyrebird, beautiful glow-worms and koalas to name just a few.